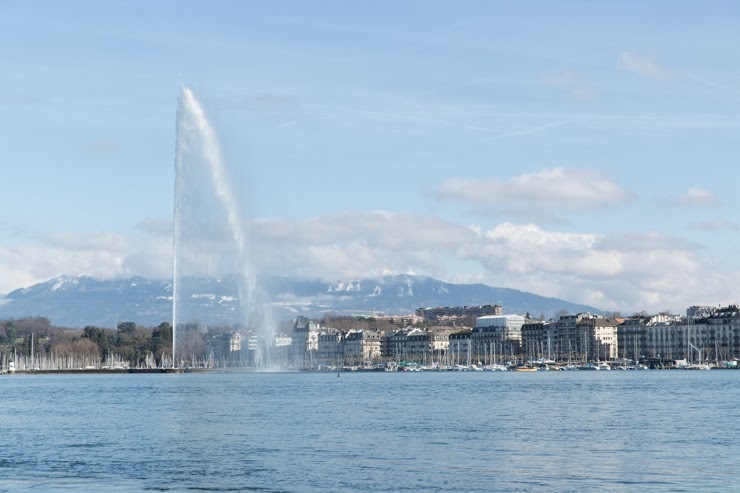 the weather in geneva last weekend was absolutely perfect. not too warm, not too cold, and with just the right dose of sunshine to get me out of these winter blues and in the mood for a leisurely sunday stroll, vanilla spice latte in hand. we walked around the river side bridges in the city center and gazed at the jet d’eau. it’s true geneva can feel like a super quiet little town, but moments like these sure make up for the lack of excitement. another thing i love about this weather? it’s perfect for layering. i don’t know if i have told you this before, but i am majorly into layering. like, seriously, passionately, even zealously into layering. the only thing i love more than layers, is stretchy pants. i discovered this pair from theory at francis ferent, and it was love at first fit. if you look closely at the last picture, you’ll see they have a little zip in the front, but that’s all just for show. these pants do not have functional zippers, buttons or whatnot – they have an elastic waistband and that’s it. i don’t have to tell you that they’re supremely comfortable, right? strictly speaking, they are leggings, but i wouldn’t call them that. their material is sturdy and pants-like so they are perfect to wear to business-y meetings, and i would never wear regular leggings for that. these pants are by far the most popular item in my wardrobe right now. that cashmere sweater is a close second though. i’d never have picked that color for myself, but ever since j.brand handed me this gift, i started reconsidering beige and cream colors for my wardrobe. i even dug up this old poncho i’ve had for god knows how many years. i love how cosy and warm it is, and i’ve always liked how flattering the dark tan color could be, even when i’m white as a ghost. so maybe i should give this color palette another try?